Evony lets you take control of medieval units, manage an economy, and battle for control of the game map. Evony is similar in style to other online games such as Travian. After you create your Evony account and choose an area of the map to play on, the game will load and you will be able to begin building your city. When you first login you start a seven-day protection period so you should begin to build as soon as possible. Once this period is up or your town hall reaches level five, you can be attacked by other players. You start with a basic town hall, a small amount of gold, and resources to begin construction of your first buildings. Buildings and units are built using food, wood, stone and iron. Gold is only used to research technologies in the game but is needed in large amounts because technologies can be expensive. The Evony interface is quite simple and easy to understand. At the top of your browser is your town, city, and map icons. 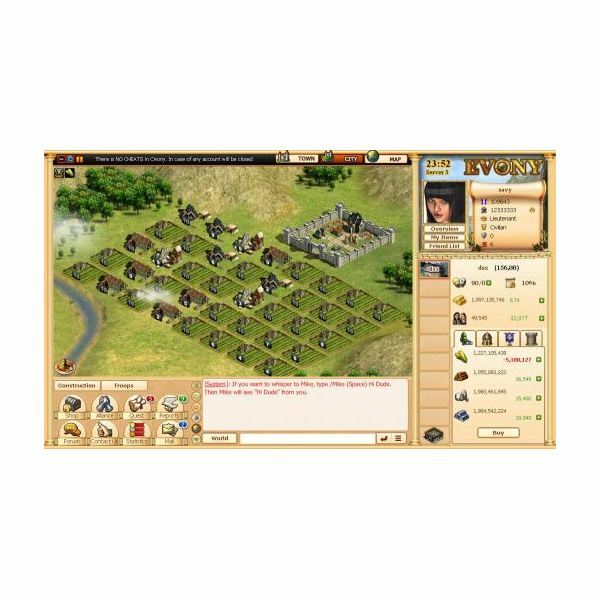 The town icon is where you build your city buildings, the city icon is for your resource plots, and the map icon is where you move your military units for battles.On the right side of the screen is your statistics panel that shows you such things as population, gold, resource, and troop levels. At the bottom you will find several icons including a link to the game forum, battle reports, quests, mail statistics, alliance, contact us, and shop. The first thing you should build are cottages. These buildings are needed to grow the population of your city. Your citizens are needed for your armies, and to provide production for your resource areas. More population will also increase your gold amount through taxes. Click the “town" icon if you are not already there and we will build our first building. Put your mouse pointer over an empty plot in your city center and a hammer will appear. Use the menu that appears to select cottage and build two to three cottages. Your population will slowly increase as you add more cottages. Each building can be upgraded to a higher level but you should leave your cottages at their beginning level for now. Build two or three cottages then stop, as you need the rest of your limited starting resources to build resource plots. Resources are vital to the building and function of your city. To begin building resource plots click the “city" icon at the top of the screen and you will see several empty plots outside of your city. Building resource plots works the same way as city structures, so build one farm, lumber mill, quarry and iron mine. Your idle population will now begin working in these resource plots and your stockpiles will begin to increase. Once you upgrade your resource plots to a higher level, you will be able to extract more goods, that will require more idle population. Other MMO games similar to Evony, that use resource gathering to build up a city, include the popular Ikariam game. Once you have completed the initial moves you will notice your quests icon is red which means you have completed some quests. You can click on quests to claim your reward and it is recommended that you follow the quests in the game from this point on. Not only will quests teach you the more advanced concepts of the game, but you will receive many awards to help you build up your empire. As you complete quest more will become available to you. To start any type of combat you will need a rally point, and a barracks. The rally point will allow you to send out your troops on missions, and your barracks will train your troops. A higher level rally point lets you send out more armies at a time, and an upgraded barracks gives you more advanced troop options. A hero is also required to do all missions from your rally point, except for scouting which is done by scout units. To hire your hero you will need the inn, and feasting hall buildings. Continue to do your quests before you think about any type of combat. You cannot attack other players until your seven-day protection period is over. To gain technology you need to build an academy. A higher level academy allows for more advanced levels of technology. There are many different types of technology, from resource upgrades to new troop building capabilities. It is recommended that you start by upgrading your resource production first. Technologies take gold and resources so you will need enough of each to begin the training process. Another important building in your town center is the marketplace. You can trade or sell goods with other players here and an upgraded marketplace will allow for more trades between players. If you have extra resources you can sell them for more gold, or use gold to acquire resources you need. Alliances are another important aspect of the game. You will need to join an alliance if you wish to have any success in the game. To join an alliance you can build an embassy and apply to the ones in the game. Once you have built the embassy you can access your alliance through the alliance icon at the bottom of the game screen. Your embassy will also allow other team members to station troops in your city to help deal with attackers. Your town center is where you manage your city. In the town center you can set taxes and manage production levels for your resources. It is a good idea to raise your taxes slightly when you begin to around 20% so you have enough gold coming into your city for technology upgrades. To defend your town from attack you can build walls and fortifications. The level of your walls will give you more protection from invaders and will be harder to break down. Fortifications include such things as traps, and archer towers. As your wall level increases, you can build more fortifications. These defenses will really slow an attack down and it will take multiple attempts by your attacker to break through. You should begin building walls and fortifications as soon as you have the resources to do so as they do take time to build. Evony also has many game items that can be obtained from quests or purchased from the game shop. These items can improve such tings as your resource production, aid in combat, and help your city grow and advance. There is also a game wheel at the bottom left corner of the screen. If you login daily you will get one game token you can use to spin on the wheel and win items for your character. You can also purchase game items for your city with real life cash in the game shop. You will be given game coins to purchase items. Players that purchase many game items through the shop have a distinct advantage in the game but it does help keep Evony free to play. Evony is fun to play and a good online strategy MMO game. It may take the beginning player some time to get used to it. Take advantage of the quests, chat, and join an alliance to understand the game better. You can also join the forums which have many in-depth guides for you to try. If you are interested in other medieval style MMO games try Tribal Wars,or BattleKnight. You can plays this great game at the Evony website and it is free to play. Look for my review of Evony Age II when the game is released. The graphics of the original game will be getting a major update as will the heroes portion of this great war strategy game.